Earlier this week the Washington post started directing users to the Syrian Electronic Army (SEA) website. It was another high profile hacking case and today we can reveal that the WaPo hack came via the content recommendation engine service, Outbrain. Outbrain has been one of the most successful publisher technologies of the past 3 years online, working with blue chip publishers to quietly help them generate more page views and online revenues. The news places focus on content discovery engines, which include Outbrain, Taboola, Disqus and Plista, showing the scale of their adoption and the value they hold for the webs big publishing brands. SEA acknowledged the hack via E Hacking news, where they provided a series of screenshots which showed the Outbrain admin panel. For Outbrain its a devastating blow. They acknowledged the attack via Twitter and their website, and their service is currently out of action. The SEA attack comes at a time of rapid growth for Outbrain. Recently recognised in London by the Association of Online Publishers (AOP) as the outstanding publisher technology company of 2013, Outbrain have been opening up partnerships with some of the internets biggest web brands. Their clients include the likes of Future publishing, CNN and USA Today, where they help the sites to recommend other interesting articles to their readers. Outbrain helps websites to keep their users on the site for longer by using detailed algorithms to improve the numbers of pages viewed by each user. The more pages viewed per user, the more money the sites can generate from online advertising. 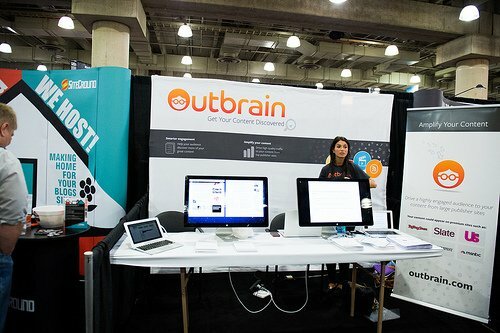 Outbrain don’t stand alone in the content discovery network space. Other companies include Plista and Taboola, who operate along a very similar vain. Other services likes Disqus focus on collect comments on the bottom of articles, and then use algorithms to help the end user discover more content related to their interests (determined by articles you read, rate and comment on). The technologies are clever and brutally effective. In a time when the google search engines are ever more competitive due to more and more publishers, ever more unstable with a raft of endless updates, and offer ever fewer positions due to google using old organic positions to advertise themselves; content discovery networks are increasingly the golden ticket. The golden ticket was undoubtably once search traffic. Traffic from google is considered free – even if the tens of thousands invested in search engine optimisation discredit this motion. Search its argued, is scalable, free and most effective. However, overlooking the already stated problems with Google traffic, there are bigger issues still. Traffic from Google does not typically consume many of the precious page views per user. Search traffic is query based, and the pages that place on the first Google results pages have been put there by google to answer your query. Readers therefore typically read the one page that answers their question or quest for more knowledge, and then they leave again. Content discovery networks are far more effective at driving page views because they capture users who are browsing and consuming media, usually at leisure. The publisher can capture users off of other similar sites and bring them in to their site on a cost effective cost per click model. The result? On a page view by page view basic, you would typically require 7x more Google traffic to achieve the same page views. Content discovery networks therefore provide better website metrics, including longer time on site, lower bounce rates and more social post shares. The other factor that plays into the hands of content discovery networks is consistency. When you’re buying traffic in you know exactly how many unique users you will get. As you control all factors, from the time of day the user lands right through to the region they come from, then you’re able to model effectively. Many publishers have found that its amazingly consistent how many page views come out of landing a user on a certain article. Take image galleries, the age old publishers friend. Land a user on a 9 image gallery, and the page views per user average can be as high as 7 or more pages viewed. For the large premium publishers who sell high value advertising, such consistency – not to mention high – page views equal an easy arbitrage model. They buy the content discovery traffic at say $0.10 cents per user. Their page views might be worth $0.03 each. An average of seven page views generated for $0.10 yields $0.21. Of course the publisher faces plenty of additional costs in creating and hosting that content, but bear in mind these big premium brands often count their page impressions in the double digit millions or higher. On the back of this, the organic traffic – consisting of search engine traffic and social media traffic primarily – becomes a bit of an after thought. All of the Outbrain, Taboola and Plista traffic gets the publisher plenty of social media shares (presuming the content is useful and the social buttons are prominent) which drives traffic back. All of the exposure also leads to much more natural SEO. Users will share the stories in forums they use or logs they write, which means that the organic traffic cycles up naturally. This leads to the final point – authenticity. SEO has always been a grey art. It’s gamesmanship, and a lot of what publishers do to achieve good rankings comes at a cost to your – the readers – experience in the site. Readers don’t want to read blocks of recurring keywords all over the place, or other such ‘SEO tactics’. Readers want to read great content. So now many of the webs great brands have started focussing on content discovery networks over search engines. This has led to the growth of some huge publisher tech companies in this space, as has been highlighted by the SEA hack in Outbrain. No doubt security will be tightened up and the publishers golden traffic will return shortly.